So the kindergarten build is underway and I am spending time attempting to teach English and Maths to the classes that need teacher cover. 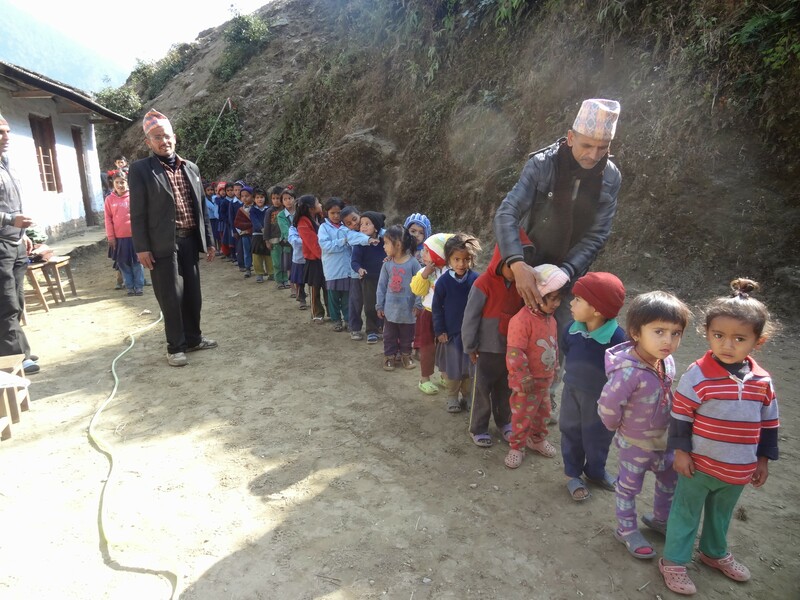 As my Nepali is non-existent and the children’s English is limited to “How are you?”, “What is your name?” and “I am fine” delivered with beaming smiles, my classes are part acting and lot so interaction where the kids get to “do” rather than listen and repeat which is the Nepalese way. The teachers expressed surprised that I hand over control of the chalk to the children to do their maths on the board, each answer to a question leading to the next calculation. The kids love it, the teachers interested in the different approach. I have been trying to decide how else to spend my limited funds, not sure how much is going to be needed on the build. In Uri, Rachel and I bought a full set of navy blue school uniforms for all the children (shoes, shirts, sweater, long pants and skirts). The headmaster is keen on a standard blue navy school uniform, but to be honest the quality of the uniforms available to buy is not great. 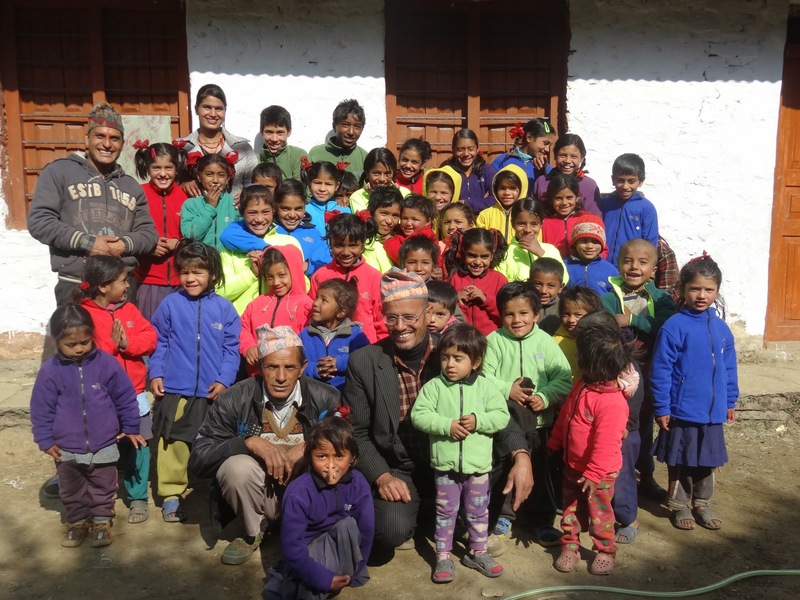 So I have decided to go for a different approach in Kalimati – Northface fleeces – lovely bright colours, really warm for the high mountains and I think more durable that the school uniforms. Because I cannot get all the kids down the mountain (what a school trip that would have been – only a few of the older ones have travelled out of the village!) we lined them up in order of size and then tried the five sample sizes I had already purchased in a “fitting ceremony”. Eventually each kid had the right size which provided me with a list of names and related sizes to shop for. Next to source the fleeces. Ram pointed me to his mate who he said would sell the to me for a good price for the bulk buy, but that turned out to be no deal at all, plus he could only provide green and a rather yucky brown. So I trawled through the tourist shops in Pokhara selling trekking kit for children’s sizes and came up with these. Lots of excitement on distributing again in height order with big piles of the fleeces on the table up front. The children were counting how many children were in front of them in the line up and then trying to count down the piles to figure out which colour they would get. A lucky few hit the bonus jackpot to get ones with a hood as well. Great excitement! Photo op time in their new Northface fleeces. (Of course fakes but they were not complaining, they are still much higher quality and hopefully longer lasting than the uniforms and the kids love the brighter colours). Plus I bought some extra fleeces n different sizes which are stored away in a big metal chest in the headmasters office for any children currently missing from school.